Today’s print edition includes a premium magazine highlighting tri-state architecture. Recently, Telegraph Herald photographer Nicki Kohl had an opportunity to get a unique vantage point on one of the area’s most iconic architectural structures: the steeple atop the former St. Mary’s church in Dubuque, which is now Steeple Square. A $2.2 million project restoring the steeple is expected to be completed this fall. As a photojournalist at a daily newspaper, assignments can range from mundane to exciting, heart-warming to tragic. I was accompanying three members of the Steeple Square Board of Directors, the campus manager and representatives from Jeffrey Morton Associates and Gronen Restoration. As we began our climb up the metal stairs that seemed to float in front of the former church, I felt my nerves start to kick in. How high up are we going? Is this really safe? Please don’t let me be the one that falls. It felt like we were climbing forever — six steps at a time. While the stairs were sturdy and didn’t sway, I felt the lump in my throat get bigger with every turn in the staircase, as I realized there were only a couple metal bars between myself and an increasingly long fall. Finally, we made it to the first level, and I stepped on to the scaffolding, finding myself on wooden boards that seemed to exaggerate every step I took. I looked around and realized that everyone else eagerly followed our guide. They were much more focused on learning the details of the work that has been done to restore the more-than-150-year-old steeple. I reminded myself to do my job and start documenting. Whenever my camera is up, the fears go away. It’s always been this way — like I become invisible or I forget that I’m out of my comfort zone. My heart rate went back to normal, and I found my footing, figuratively. 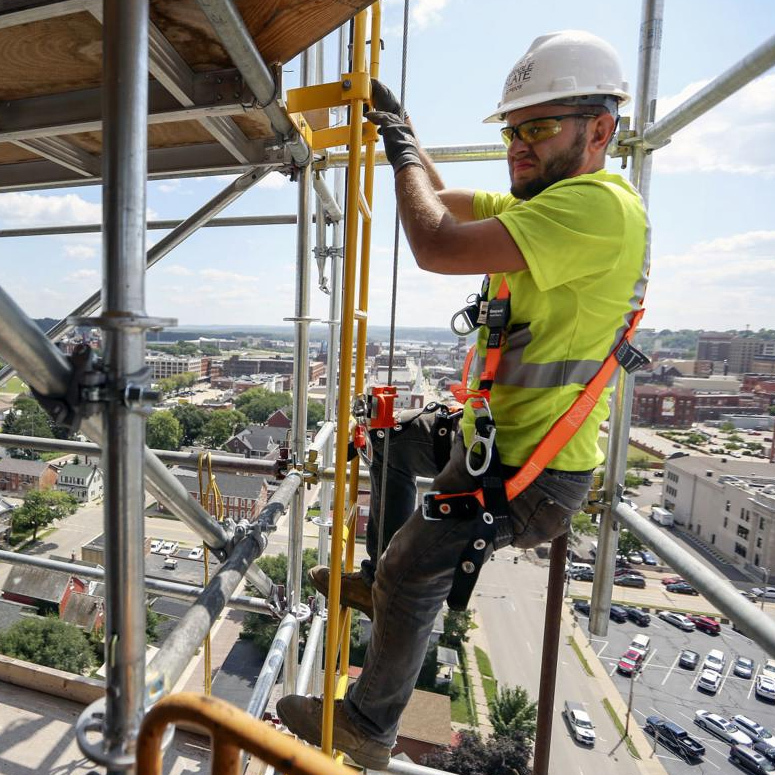 The workers showed me the confidence it takes to work high above downtown Dubuque. They seemed to float along the scaffolding, legs sometimes dangling through gaps in the boards, bracing themselves in tight corners, to be able to work on the delicate details. Eventually, I was presented with a ladder that was necessary to climb even higher. The rest of the group excitedly hooked on to the safety line and started to climb. The nerves came firing back, and I hesitantly followed behind. Two of the group members went to the very top, but I stopped where my stomach and quivering arms told me was right — a few levels below but still with a beautiful view of Dubuque. I remembered how lucky I am to have a job like this. While I might not have climbed Everest or bungee-jumped off a bridge, this was one of the most exhilarating, terrifying things I’ve ever done. I have a new respect for people who work at these heights, and I don’t foresee a career change to steeple restoration. By NICKI KOHL. View article online here.